Thrilled to announce the newest addition to our Double Fine Presents lineup, Gang Beasts. The title comes to us from UK-based studio Boneloaf, which was founded by three brothers James, Jon, and Michael Brown (awwwww) who joined up with artist Jason Pugh to create experimental party games. That’s just what they’ve done with Gang Beasts, which very quickly became a go-to title for all our multiplayer gaming needs. The game is a local multiplayer brawler in the style of Streets of Rage or Double Dragon that allows you and your buddies to fight alongside each other and face off head to head. It’s a jolly good time full of silly procedural animation and ragdoll physics that will no doubt insight giggles and guffaws. 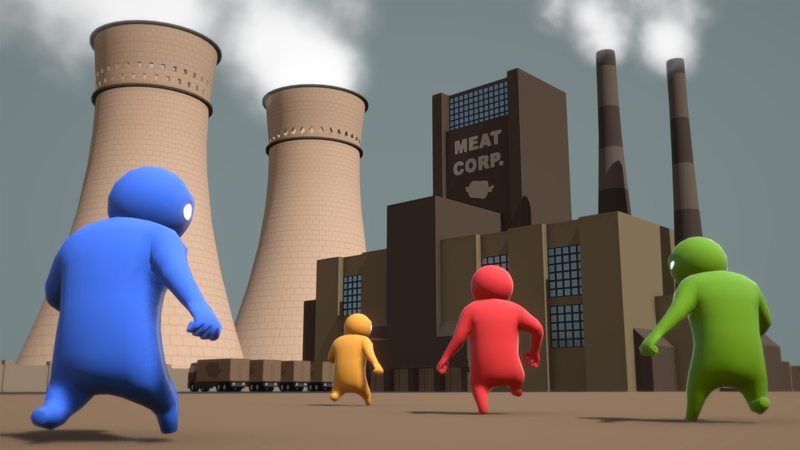 You may have seen Gang Beasts on one of the many popular Youtube videos that are already floating around, or perhaps you even played the pre-Alpha build that has been available for a while now. Well the team has been hard at work at preparing a shiny new alpha build that is going to be landing on Steam Early Access on August 29th! Should you happen to be heading to PAX Prime, we’ll be there alongside the Boneloaf guys demoing the game at our booth (#117)! Come by and check it out. If not there, then hopefully we’ll see you at Fantastic Arcade where the game will also be shown as a one of 8 Spotlight games alongside fellow DF Presents title, Mountain, which as of today is newly available on Google Play, Amazon, and Steam! "I am impressed by the information that you have on this blog. It shows how well you understand this subject. Bookmarked this page, will come back for more. best dehumidifiers"
"I've got surfed online looking for a switch where by I could truthfully receive as often information on academics generate available as one web page as is possible. When i seemed to be and so thankful to help essay or buy essay writing and services with your information sites. There're and so loaded having facts it becomes unattainable to seem anywhere else." "Amazing story with a lot of valuable content. Like the style of writing. Have fun with this. embroidered patches"
"Okay, i must say this is great Satellite TV 2015." "Ich komme aus Pulau Tidung und ich liebe, Spiele zu spielen, vor allem, wenn chip Spiele dieses Krieges. Mein Haus sieht sich als touristischer Ort, der es immer überfüllt mit Besuchern Tour, sofern ich Spiele spielen gemacht hat. Für diejenigen unter Ihnen, die wollen, um sonstige Informationen zu erhalten, wo ich lebe Sie meinen Artikel via Titel Paket Pulau Pari lesen wissensstand"
"You actually take a look at essay mania company for instance it’s a common efficient essay company out there. Photograph trough a great number of expert services plus out of this practical experience, its very difficult so that you can have faith in these folks. Do you provide people that your some may be every several?" "Actually, I am not supposed to be here when I was searching any references for my research. However, I am here right now. Unexpectedly, you have all my need. Surely it saves my time a lot. cfnol kresemku aminah"